2.Whisk eggs, sugar, and brown sugar into a white and fluffy mixture. Afterwards add the oil gradually by low speed. 3.Mix the flour, baking powder, baking soda, vanilla, salt and cinnamon. 4.Add the dry ingredients carefully into the egg mixture and add the grated carrots and chopped nuts. 5.Fill the cupcake forms with ¾ of the dough and bake for about 15-20 minutes. 6.Cool the cakes completely before decorating with the frosting. 2.Take a small part of the frosting aside and colour with green paste to create small leafs for later. 3.Colour the remaining frosting with orange paste colour and put into a piping bag with tip1M fra Wilton. 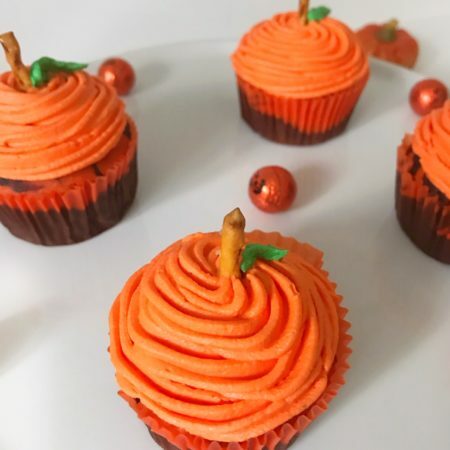 1.Decorate each cupcake with orange frosting. Start by piping from the edge of the cake until the middle. 2.For the leaf use tip 352 from Wilton. 3.Break a small piece of the salt cracker and place in the middle of the cupcake so it looks like a small stem.